I've made a few models so far, and keep getting too many ideas for new ones. On the left are my more standard custom models, you see my bed and a very bad view of my ladder, plus a lot some remapping. 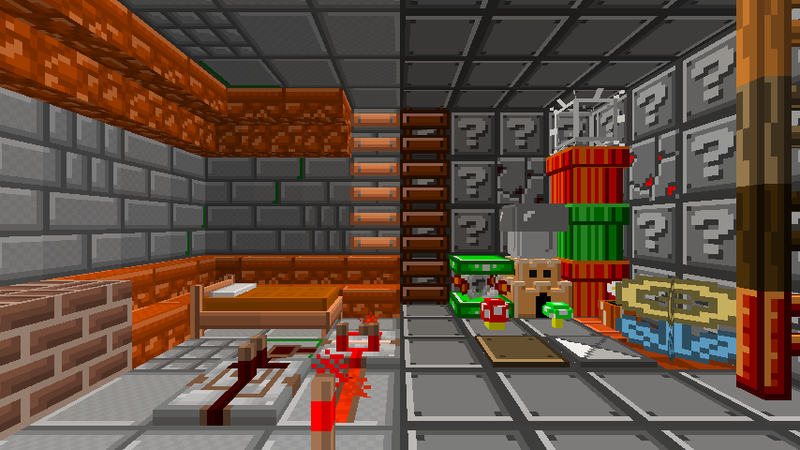 The right contains my Mario themed models, with an equally bad view of the ladder, slime block, end portal frame, anvil, hopper, web, mushrooms, flower pot, and crops (how did I miss my cactus?). The rest is remapped. I gfy I made showing the effectiveness of my custom modeled rifle. It's much more accurate than the standard crosshair, which I will remove. That sounds quite sketchy. You are a decently credibly source, but could you give us more information? Could someone tell me how to do this? What do you mean? It is just a standard custom model... Click on the link! Oh, I didn't recognize the website it was directing to. I am always suspicious of new websites. You should chillax, Unct! Pretty sure even the mojang crew themselves even use gyf for show off their .gifs.